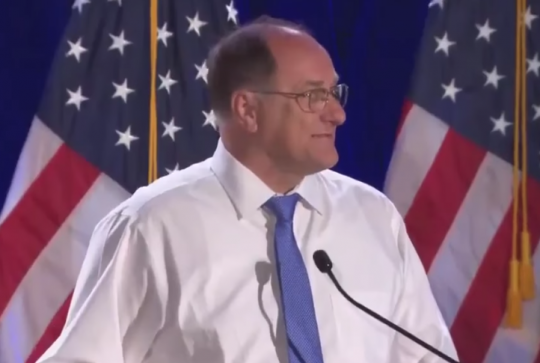 Another Democratic lawmaker with strong support from the party establishment has gone down in a primary, as Rep. Mike Capuano (D., Mass.) conceded defeat to Boston City Councilwoman Ayanna Pressley. Capuano has served in Congress since 1998, just like his fellow outgoing Rep. Joe Crowley (D., N.Y.), who lost in a shocking upset to Alexandria Ocasio-Cortez in June. Pressley was endorsed by Ocasio-Cortez and also ran on a left-wing platform, but Capuano campaigned in the deep-blue seventh district and was mindful of the need to play to the base by attacking Trump and maintaining a progressive platform—to no avail. Pressley is the first African-American woman in the Boston City Council and is almost sure to be the first to represent Massachusetts in Congress. While she did take some positions to the left of Capuano, such as abolishing ICE, she campaigned primarily on the goal of changing the identity of the party. "This is a fight for the soul of our party, and the future of our democracy, at a time when our country is at a crossroads, the Massachusetts 7th is at a crossroads," Pressley said Tuesday. "It’s a new day," said former Boston School Committee member Alfreda Harris. "Younger people are getting involved in politics, and particularly black women. It’s good for the country and it’s good for the state of Massachusetts." "These times require bold, activist leadership. Someone that will coalition build and movement build," Pressley told volunteers at an election night-eve rally at her campaign headquarters in Jamaica Plain. Pressley said the attention on Ocasio-Cortez helped juice her candidacy and bring in financial support, even though Capuano outspent her 2-to-1. She said Sunday the media has taken a greater interest in her since then and predicted national attention upon her victory. "I didn’t feel [national media attention] until the New York race," Capuano said Sunday. "I don’t know, but I would presume people in the media were probably disappointed that they missed that, and trying to make up for it now … My expectation is come Wednesday, there won’t be a whole lot of national attention anymore because we will have proved that the case here is there will be no surprises." Capuano gave short remarks and said he understands Bostonians are upset. "This is life, and this is okay. America is going to be okay, Ayanna Pressley is going to be a good congresswoman, and I can tell you Massachusetts will be well-served," he said in a short concession speech. Capuano felt pressure from Pressley’s campaign, leading him to put more resources into campaigning than Crowley did. Part of his message was that he would carry more clout in Washington than a newcomer. Capuano had said he expected to contend for a House leadership position should Democrats retake the House in the midterm elections. In that effort, he also touted his high marks from national progressive groups such as NARAL, NAACP, and AFL-CIO. This entry was posted in Politics and tagged 2018 Election, Democratic Party, Massachusetts. Bookmark the permalink.